The Fourth of July is one of our nation's most important holidays. It's a time when families and friends across the country get together to celebrate our freedoms. It's also a time when our pets get a lot of attention, too. People take them along to parties and campgrounds. 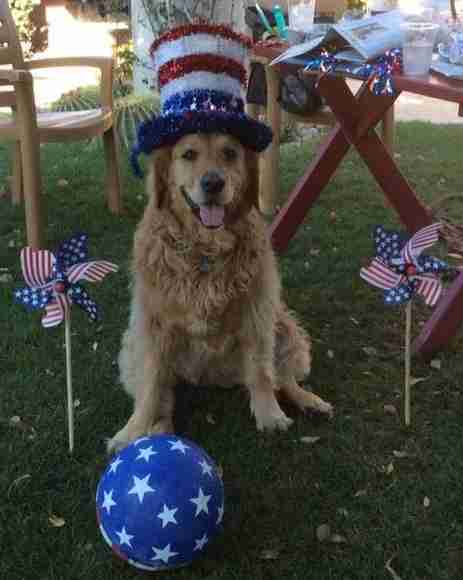 Some of us have fun dressing our pets up like Yankee Doodle dandies. I do this with my golden retriever, Morgan. But when the sun sets and the day is capped off by an explosion of "rocket's red glare" and "bombs bursting in air" that's when trouble can start for our pets. 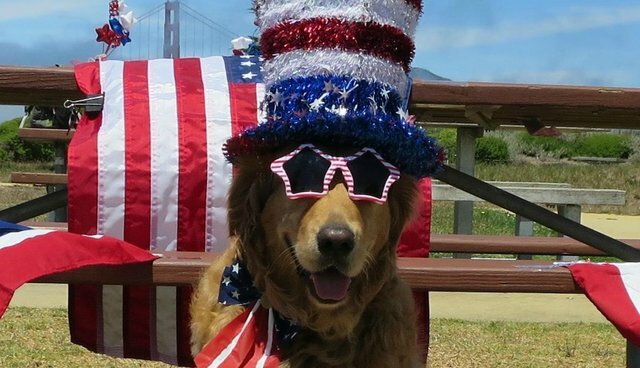 According to the Humane Society and the ASPCA more pets run away on July 4th than on any other day and it's because of all that popping sound going on. Our furry friends just want to get somewhere away from the noise as fast as possible. Our pets are pretty clever when they're frightened. They can dig under or jump over a fence. They can squeeze through a small opening. They'll find a way to unlock a latch or just jump out a window. Tying a dog up on the patio doesn't guarantee their safety, either. They can come loose from a rope or just bite through it. With all that noise pets do things that they don't ordinarily do. Also, don't forget that with so many people coming and going there's a good chance that someone might accidentally leave a door or a gate open and once your dog or cat is out - they're gone. A frightened pet won't stop running until they find a quiet place. We have a holiday tradition at our house. Just before sunset I make sure all the doors and windows are closed tight and then I set up a comfortable spot for Morgan in the closet where he likes to hide when he's nervous. For the most part I stay right near him with treats. Playing background music to drown out some of the noise is recommended. I know about things like this because I've learned from past mistakes. When I lived up in northern California along the Russian River I will never forget how my second golden got loose one holiday afternoon when neighbors across the river lit off some firecrackers. Luckily I found Willy safe up the hill at a friend's house. As this example shows it isn't just the night of the fireworks that problems can arise. One year, when we were visiting my family on Cape Cod, the people up the street lit off firecrackers for an entire week. It took constant vigilance to keep my dog secure. People who have never had a canine or feline family member might not know what it's like for their pets and in the excitement of the celebrating it's easy to forget. So, my Independence Day wish for everyone is to have a safe and fun Fourth of July. But for all of our sake, before you rush off to get more sodas or another package of burgers and buns for the unexpected guests, take an extra minute to make sure your four-legged friends are secure and safe.